Two Superheroes Unite for One Blockbuster Proof! (Web-slinging) hands down, one of 2017's hottest films is "Spider-Man: Homecoming." But why the title? If you're a die-hard Marvel fan, it's the homecoming of Spider-Man to the Marvel Cinematic Universe, or MCU. Tony Stark's quick recruitment of Peter Parker in 2016's "Captain America: Civil War" has blossomed into a full-on "internship" at Stark Industries. But when Spider-Man's pursuit of The Vulture threatens the lives of innocent people, Stark repossesses Peter's tricked-out suit -- leaving him with only his wits and radioactive gifts to save the day. But, even with victory in sight, what future wars lie ahead for Spider-Man and the rest of the Avengers? An Acclaimed Artist Finds His Perfect Subject! It's also a homecoming for John Mercanti, 12th Chief Engraver of the U.S. Mint and renowned designer of coins, including the reverse of the beloved United States Silver Eagle. A true celebrity in the coin world, mention Mercanti's name among collectors and you'll receive instant recognition. But, it turns out that Mercanti is also a massive comic book fan! 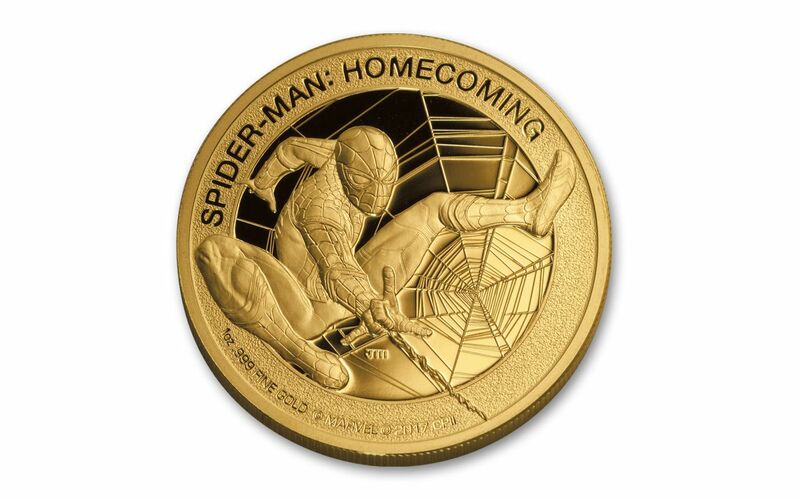 When the opportunity to design a coin for "Spider-Man: Homecoming" came up, John cleared his work schedule just to work on this "dream come true." 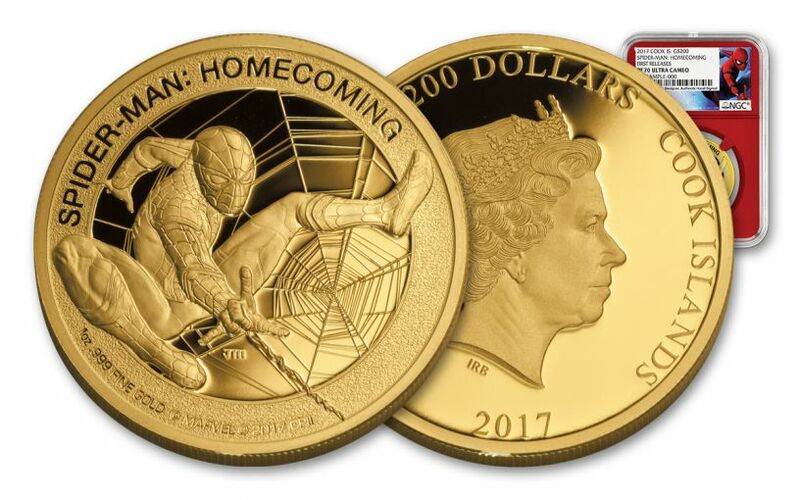 Now, the superhero of coin design has completed this gorgeous passion project -- introducing the 1-oz Gold Spider-Man: Homecoming Proof! The First One Ounce Gold Spider-Man Proof EVER! That's right! With Spider-Man in full web-slinging and sky-swinging form, John Mercanti's design brings Peter Parker's alter ego to life in one ounce of 99.99% pure gold for the first time ever! The action is all set against an intricate spider web background and wreathed with the title "Spider-Man: Homecoming." 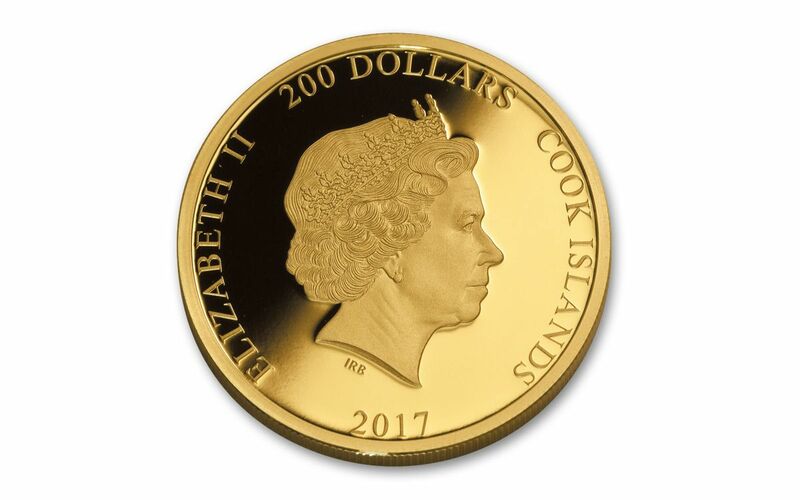 Flip over this legal tender 200 dollar Cook Islands coin to find Ian Rank-Broadley's portrait of Her Majesty Queen Elizabeth II. Proof-minted using polished dies, multiple strikes and hand-selected planchets, this coin shines with mirror-like surfaces and razor-sharp details. Your 1-oz Gold Spider-Man Proof also comes with these "Amazing" features! 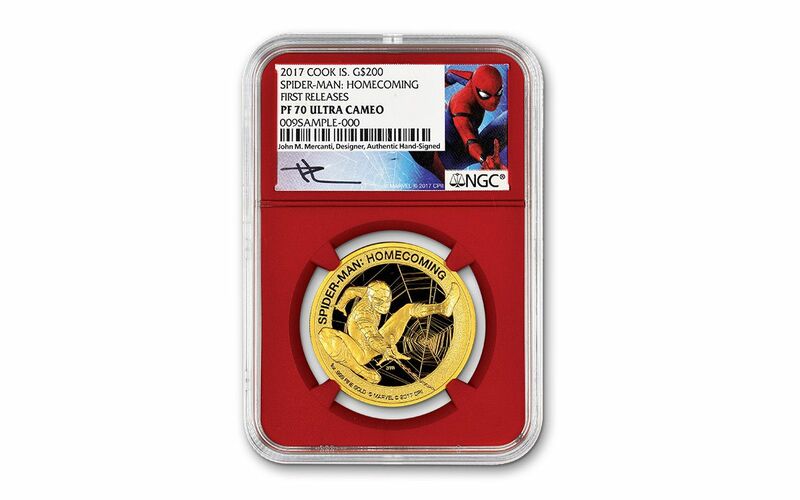 - Your coin will be certified Proof-70 Ultra Cameo (PF70 UC) by Numismatic Guaranty Corporation (NGC), a distinction that means your perfectly-graded Spider-Man Proof will have ZERO imperfections -- showing all features and fields exactly as the engraver and mint intended! - Your Spider-Man Proof will also be certified First Releases (FR) by NGC, meaning that it was among the first struck by the mint and was verified within the first 30 days of issue. Collectors seek out these proofs because they are produced with new dies and considered to have sharper strikes and deeper mirrors than those that are struck later. Also, the population of proofs labeled First Releases is only a fraction of the total mintage! - Your proof will be sonically sealed in an acrylic case with a special red display core -- giving you the best in protection while granting clear sightlines into every beautiful detail. - In addition, all of your coin's unique characteristics will be described in detail on the acrylic case’s special Spider-Man label, which will also come hand-signed by designer John Mercanti! - Finally, you'll receive a numbered certificate of authenticity confirming this coin as an official Marvel release! 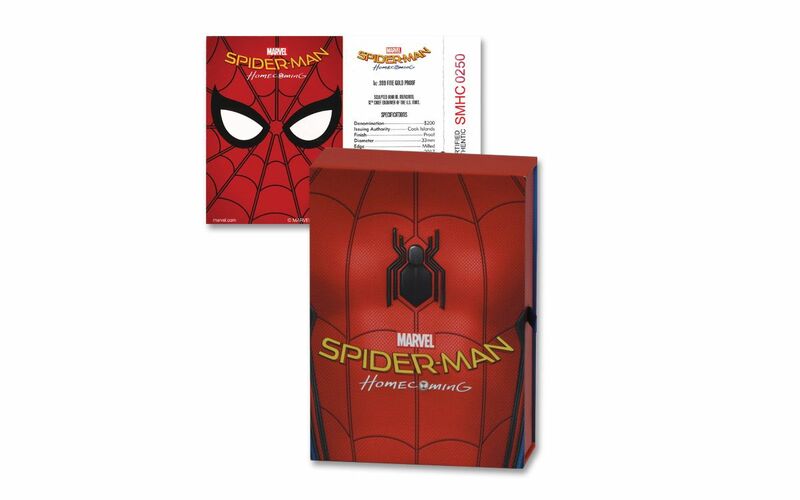 An official Marvel Release, your 1-oz Gold Spider-Man Proof will arrive along with a numbered certificate of authenticity. Spider-Man has been fighting crime for over 55 years, catching countless fans in his webs. But, only 250 of these 1-oz Gold Spider-Man Proofs will be minted for Spidey's global audience. And, with 2017's newest adventure, we're expecting Spider-Mania to make quick work of these proofs! Don't wait another second -- do whatever you can to sling this proof home today!